Contemporaries of William Shakespeare rated him just on par with other notable playwrights and poets. Fifty years after Shakespeare’s death, John Dryden noted that the bard’s plays were being performed about half as often as those of Francis Beaumont and John Fletcher. Beaumont and Fletcher had become more successful than Shakespeare, especially with Philaster, or Love Lies a-Bleeding. By the end of the seventeenth century Shakespeare’s excellence had shone through. He took the place he maintains today as the greatest of all English-language poets and playwright. Success relates to the standards and opinions of others and is fleeting. 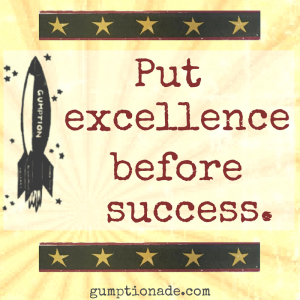 Excellence relates to personal development and has enduring value. You may or may not have success, but you can be excellent. If you must have success, you place your happiness outside of your control. Focusing on personal excellence, however, creates an internal center of gravity. As any tightrope walker will tell you, controlling your center of gravity builds courage. Excellence is built by process: hard work, sound methods, and time. Success is influenced by luck. A person, a company, or a nation stumbles across a pair of seven-league boots and quickly laps the field. If I win $10 million in the lottery or Chevron finds vast oil deposits under my house, I am a great success. When was the last time you saw a Sony Walkman? Why did Martha Stewart go away for five months in 2004? seventy-seven years, have filed for bankruptcy in 2009? The drive for excellence is about building legitimate pride in the growing mastery of a skill gardening, say, or swimming, playing the cello, selling shoes, or using Excel spreadsheets. The drive for success, however, is often rooted in vanity, that is to say in the usually doomed attempt to feel worthy by making others see you as worthy. Pursue excellence and you will be in control of your center of gravity. Pursue excellence and you will build your courage. And it takes courage – buckets of courage – to make meaningful and lasting change in how you live. Want to achieve your goals in 2018? ? 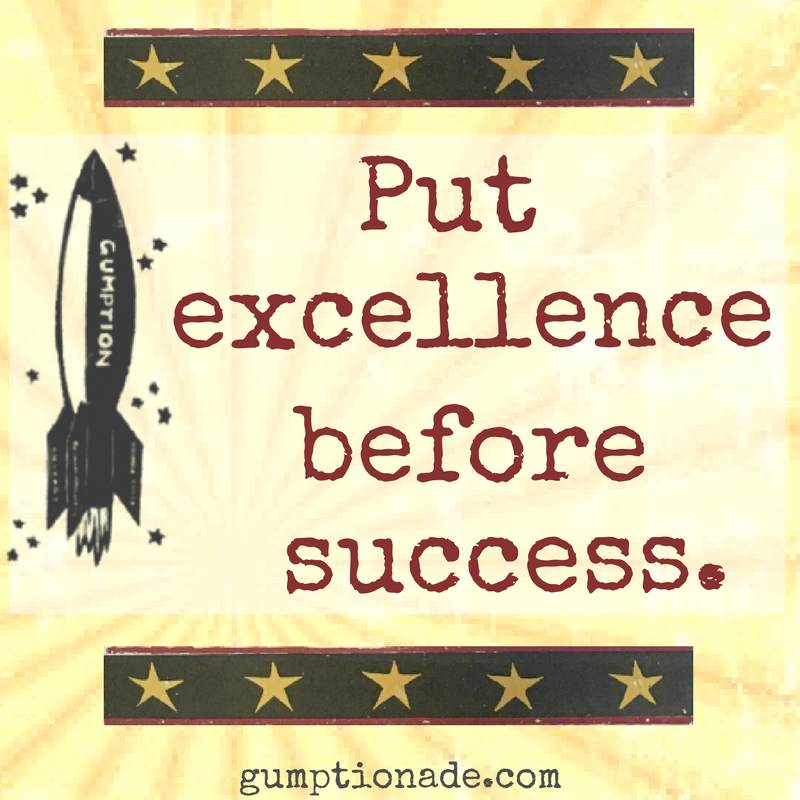 Gumptionade – The Booster for Your Self Improvement Plan will show you how.